Once again, the drums of war are sounding in our region. 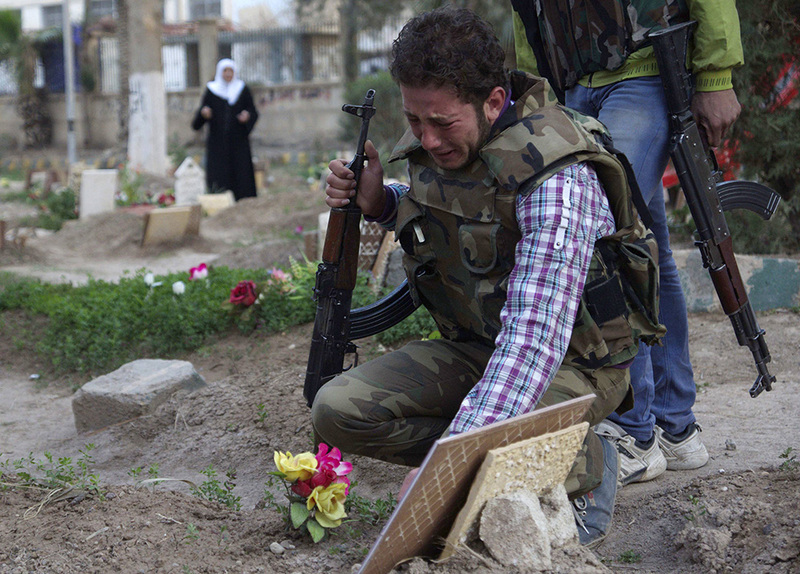 Once again, the US is leading the campaign for this war, this time on Syria. And once again, the US and some European and Arab countries are justifying it in the name of democracy, human rights, and humanity itself. We call upon churches worldwide, as well as other civil society organizations and networks, to take a stand in opposition to this intended war which will not herald any just peace. We commend the UK House of Commons’ decision to refuse participation in the possible war on Syria, and we urge the US Congress to do the same. We note the two decisions President Barack Obama’s announced on Sunday 1 September 2013: his “decision as President of the US” (as he phrased it) to launch a targeted attack on Syria; and his decision to seek approval from the US Congress. In the same address, President Obama referred to his concern for “national security”. We also hear the urgent “call upon churches worldwide, as well as other civil society organizations and networks, to take a stand in opposition to this intended war which will not herald any just peace” in Kairos Palestine’s statement on Syria (see attached). We agree that the use of chemical weapons such as on Wednesday, 21 August 2013 in Ghouta should be condemned unequivocally. It is against international law, it is inhumane and it does not reflect the kind of world we choose. Those who are responsible for instigating the use of chemical agents should be held accountable. As such we shall welcome a thorough analysis resulting in credible intelligence on this matter. We interpret President Obama’s logic as contradictory and his application of international humanitarian law as inconsistent. He referred to the fact that chemical warfare is illegal and therefore requires a response. Yet a military intervention such as the one Obama suggests without the sanction of the United Nations will also be illegal. We cannot accept such blatant hypocrisy. Moreover, an illegal military strike by the US on Syria may deepen and broaden the conflict in the region and trigger the involvement of more countries resulting in a long and bloody war that can spill over to the rest of the world. The approximately two million refugees (which include thousands of Palestinians who were displaced during the 1948 Nakba) place an unprecedented strain on communities, infrastructure and services in host countries. What is at stake here is not only the national security of the US, but also (and at the very least) the security of the Syrians and those in the region. We call on President Obama and the US Congress to adhere to all international humanitarian and human rights laws in their interaction with Syria, to not hide or misrepresent these aspects in their political arguments and to not regard military intervention as the only option. To us, one more casualty will be one too many. Moreover, we urge President Obama and the US Congress to not desert the Syrians, but to urgently implement legal initiatives to condemn the use of chemical and other illegal warfare in Syria. We are appalled that when recently more than 1000 Egyptians were killed by the Egyptian army, the USA did not express its abhorrence. Another glaring example of Washington’s selective application of human rights and humanitarian laws in the Middle East applies to Palestine and Israel. Here the US attempts to broker a peace settlement without, for example, enforcing Israel to stop building settlements that are in clear violation of international law. Therefore we ask President Obama and the Congress to also uphold all international humanitarian and human rights laws and all rulings of International Courts and the United Nations in their international relations and peace negotiations with Egypt, Israel, Palestine and all other countries. Like Kairos Palestine, we condemn any calls for war. We call on all parties involved to do all in their power to reach a negotiated, peaceful and just settlement and we suggest that such negotiations take place under the auspices of the United Nations. We support Pope Francis’ calls for prayers and fasting on 7 September for peace in Syria. The recently celebrated dream as expressed by Martin Luther King Jr is a dream of dignity for all people. However, creating and sustaining more and more division in order to serve ideological interests will not serve to realise this dream, but will increase the instability and tension for the women and children and minorities of the region. We want the realisation of this dream to apply to all as we believe that our spiritual task is not to be religious with the purpose to advance fundamentalism and exclusive narratives, but rather to become more human since all are created in the image of God. Marthie Momberg, Rev Moss Nthla, Dr Stiaan van der Merwe and Rev Edwin Arrison, on behalf of Kairos Southern Africa. 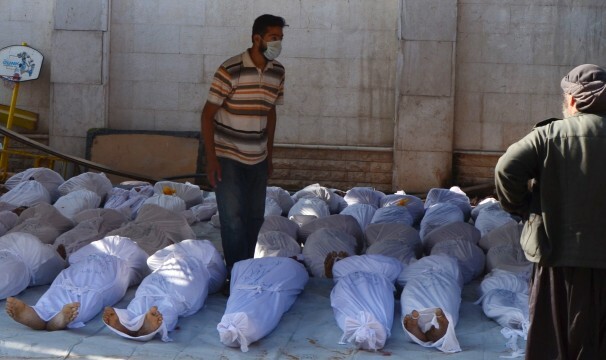 Reuters: Activists inspect bodies they say were killed in a toxic gas attack. PS For Obama’s confidence about violating international law – click here. Met alle mitsen en maren die we er vanuit ons persoonlijk perspectief vanaf het bankstel aan toe zouden kunnen voegen, zijn de persberichten van Kairos Palestine en Kairos South Afrika over de Amerikaanse (en Europese?) oorlogsplannen tegen Syrië het lezen meer dan de moeite waard. Iedere buitenlandse militaire interventie aldaar kan alleen maar een vuistslag in een wespennest betekenen, die het conflict slechts laat escaleren en tot meer bloedvergieten zal lieden. Bovendien is het nog lang niet zeker of het Assad-regime werkelijk achter deze gifgasaanval zat. Moskou beweert dat het een ”flase flag operation” en een doelbewuste provocatie van een islamistische rebellenfactie moet zijn geweest. Hoe het ook zij; alleen een dergelijke controverse al is tekenend voor de volstrekt onoverzichtelijke chaos, alsmede de ongebreidelde moordzucht en bloeddorst, die in Syrie heerst en die maar al te makkelijk naar buiten toe kan uitslaan. World Reformed Churches on Palestine: Christianity’s integrity is at stake! Why advocate for Palestinian rights?